Young lawyer Ed Davis sits in his boss’ fancy office, sure he is about to be fired. After two years of gradually slipping into addiction, he has finally hit bottom, and pretty much knows it. Instead though, Ed is offered a mission to an exotic island and a promise of redemption. Find fugitive gambler Orleans Moss and save his career? Seems easy enough. But Ed’s personal ghosts follow him to remote Panglao island, where nothing, including himself, is what it seems. Get the story on Amazon! 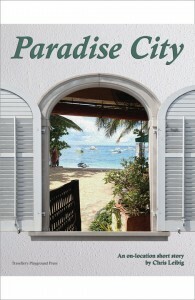 SFP: What inspired you to write Paradise City? Chris Leibig: It’s part of what will hopefully be an ongoing series of short story/novellas which will often take place in locations I’ve visited. Episode two will take place on the island of Trinidad, and lead off with Paradise City’s presumed villain, Cefus Mize. Oh yeah, and it’s the name of a Guns n’ Roses song. SFP: What is the underlying theme of the story that you want readers to walk away with? Chris Leibig: Paradise City is about a guy who is sort of outwardly successful, but whose life is actually crumbling from within. He gets a chance to travel to paradise on a mission that can redeem him in some way or another, but the paradise he finds is in sharp contrast with how he actually feels. The main character, Ed, finds redemption in a different way than he supposed. Or does he? Episode two will expand on that. SFP: What is your writing process? Chris Leibig: On a short fiction project I usually write to completion, than revise again and again, usually with the help of quite a few people – some of whom are way better at this than me. On a novel, it’s different. I have to get feedback along the way. To see which direction things should go. In either case though, the story driven by the characters. Invent them, understand them, put them somewhere with a problem, and they can take over. SFP: How has technology impacted your ability to gain readership? Chris Leibig: So far, I have to say it has not. I have two published novels through a small press in London, but no substantial sales. Without marketing and such, I think it is very hard to drive sales. SFP: How does your work as a defense lawyer impact your writing? Chris Leibig: Constantly. When I’m in the mood, I make notes all day of ideas that come up while talking to clients and defending cases. Even little quotes, the way someone says something or reacts to a situation, can head somewhere. At the end of every day, when I remember, I write down my favorite quote of the day. Later, I look through them and remember something I can use.